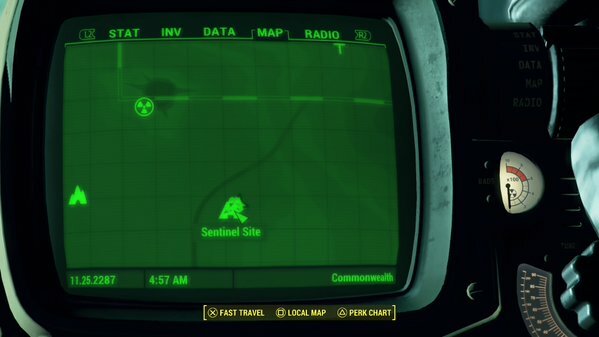 - Sentinel Site Prescott is located in the far southwest of the Commonwealth, deep inside the Glowing Sea. It appears as a large, pyramidal structure to the southeast of the Crater of Atom. Hopefully you have some serious radiation protection in order to get that far. - Sentinel Site Prescott is an enormous, vertical shaft. If you have Power Armor you can make a bold jump to get to the bottom, but everyone else will have to make a lengthier trip along the catwalks. We’ll go the safer route. There’s not much down the right path from the entrance, so unless you’re interested in toolboxes, take a left. - The blue door on your left contains nothing of value, so head back out onto the catwalks and continue your descent. There’s another room coming up with another blast door hideaway; check it out and head downstairs. The path continues. - The next terminal you find can shut down the launch sequence that’s blaring at you constantly. This will also unlock the blast doors and allow you to use the elevator at the other side of the room, which will send you back to the surface. - You’re almost at the bottom. There are a few Feral Ghouls down here that will come at you, but they honestly seem kinda lazy, so you shouldn’t expect much trouble. Descend into the pit (yay, nuclear weapons down here!) and you’ll find dead ends in all directions but to the east, where there’s a tunnel. Head towards it and Mole Rats will leap out of the ground, so be ready. - The path ahead is extremely straightforward, and when you make your first left you’ll be staring at a big group of Ghouls. They can be quite problematic if they catch you off guard, so take this corner slowly and hurl a grenade at ‘em for a quick, easy kill. - At the end of the catwalk is a split in the path. Go right and you’ll find a bed / locker room. There are medical supplies inside, and not much else… though you can find a Vault-Tec Lunchbox under one of the beds. Yay! To the left is a northward passage, and going far enough down it will bring Ghouls out of the walls on your left. Waste ‘em. If you go through the largest of these holes you can find a rocky side area with, huzzah, another Vault-Tec Lunchbox! The fun never stops down here. - A hole to your right leads back to the catwalk, as well as another split. If you take a right you’ll find the other half of the sleeping quarters; beware an active Ghoul beneath one of the beds. Not much to see here. Take a left and the catwalk carries on to another split. Go left again and you’ll find a watery room with a number of resting Ghouls waiting for you. Take them out from the door. There’s very little inside… except for another Vault-Tec Lunchbox. It’s sitting behind one of the bombs. Oh man, I can’t even. - To the side of this room are stairs leading up to a side office. In here you'll find Brother Henri, a member of the Children of Atom, who is watching over the site's nukes with an Assaultron named Atom's Wrath. You may have to fight them as part of the quest Liberty Reprimed. You'll find Henri's Terminal Password and Henri's Instructions on his body, and Captain Dunleavy's Holotape on a nearby table. You can use the Password to open a door in the previous room; beyond you'll find a loooooot of nukes. - You’re done with this place. Hop on the lift - there’s a trunk here with some more goodies - and hit the button. You’ll be sent up to the surface and emerge onto the Glowing Sea again, appearing out of a tower a ways to the northeast of the Sentinel Site. Be careful getting down from here, as there are some powerful Bloodbugs about, as well as a fair number of Ghouls.